Dr. Cindy Royal is an associate professor at Texas State University in the School of Journalism and Mass Communication. 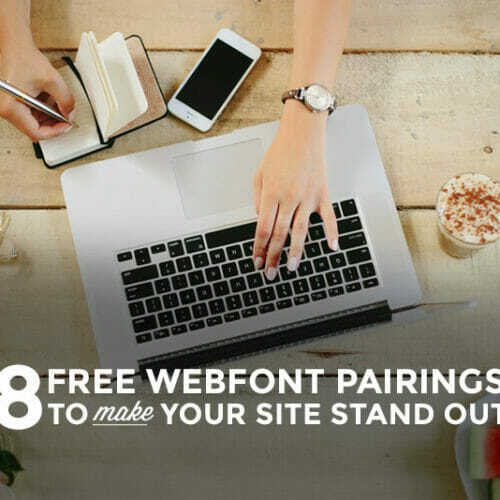 She teaches Web design and digital media concepts. For the 2013-2014 academic year, she is in residence at Stanford University as a Knight Journalism Fellow, where she is working on a platform to teach journalists and other communicators how to code. You can follow Dr. Royal on Twitter @cindyroyal. How did you get bitten by the tech bug? I’m not exactly sure when it happened. I took some programming classes way back when I was an undergrad at the University of North Carolina. During my business career, I had to learn and adapt to a range of technology tools working for technology companies NCR Corporation and Compaq. I had always been good with things like spreadsheets and analysis programs. But I think it really hit me when the Internet and Web started integrating communication and sharing with technology. That’s when I decided to get a PhD that focused on this intersection. I learned some Web design on my own and the rest is history. Tell us about your career/experience in the tech industry as a woman. What was it like? For NCR and Compaq, I worked in variety of professional roles in finance, marketing and sales. But, I had limited exposure to programmers. That changed when I was in a project management role, and worked with people who did CD-ROM and Web development. It opened my eyes to the potential of learning to code. I was fascinated by the creative aspects of Web design and that led to my decision to study the effects of the Web in the journalism and mass communication environment. Technology is important to all aspects of life. We need a diversity of voices to participate in its development so that these important tools reflect a range of interests. Technology careers are challenging, fun and gainful, so women should have this opportunity for professional growth and satisfaction. 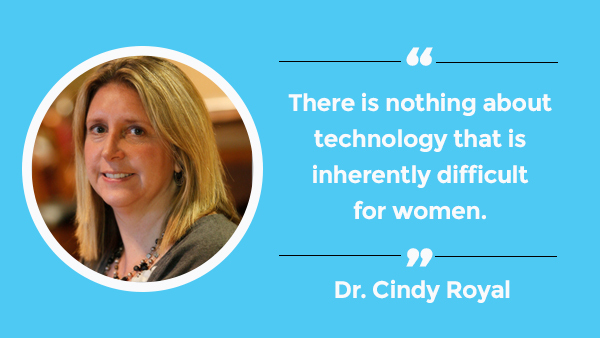 There is nothing about technology that is inherently difficult for women. I have had much success with igniting a passion for technology within young women in my classes. Why is it important for non-computer sci majors, like Journalism and Advertising, to have a solid web development foundation? Tell us about some of your students’ struggles and what you do to get them through their pain points/challenges. I have had to recognize that different people learn in different ways. When teaching digital skills to communication majors, the two key aspects are support and context. Students need to learn programming in a supportive environment that provides explanation, tutorials and lab time for practice. And, all the examples need strong storytelling context in order for them to be relevant to communicators. I find that students can learn in a variety of ways – in class, online, helping each other. I think that patience, repetition and a logical flow of topics are key to teaching technology skills. 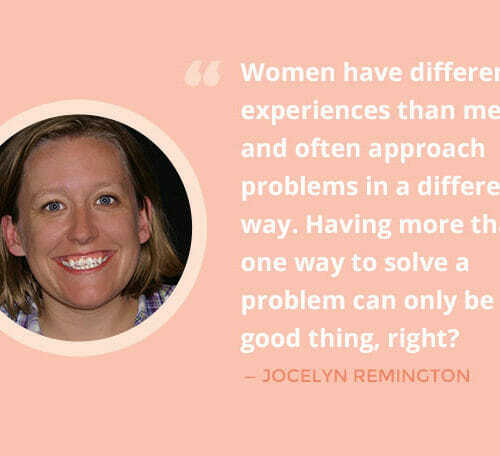 What advice do you have for women who want to learn to code, but are hesitant or nervous? Just do it. Programming isn’t something you can learn in a night or a weekend. It is really a problem-solving approach that comes with time and experience. Start out with a project in mind, like a personal portfolio, and practice the skills you need to make it work. Think about what you want to get out of programming skills and then focus on those goals rather than trying to take on everything at once. Use online platforms. We talk to our students a lot about lifelong learning and continually expanding technology skills. Can you speak to this? What do you tell your students and what advice do you have for others? Lifelong learning will be required for everyone. Technology has fueled the pace of change, and now students need to be able to learn new topics quickly and be prepared for jobs that may not have existed when they were in school. I try to emphasize learning how to learn and being resourceful with online tools to teach yourself. Sometimes you just have to Google a question to see that it’s already been answered in several different ways all over the Web. What technology are you excited about learning next? What advice do you wish someone had given you when you first started out in tech? I just wish I could have gotten started sooner on the right track. I spent a lot of time in the technology industry, but as a business or marketing professional. I wish I would have moved into programming and development earlier. I think I would have appreciated it if someone would have encouraged me to relax, seek out a career I loved and not waste so much time on things that didn’t interest me. Tell us a bit about your research interests and goals. My research interests include studying the emerging role of programmer/journalist and the use of data visualization to tell stories. I am also interested in how gender and technology play out in academic environments, and I feel we have an opportunity, in disciplines with a high percentage of women – like mass communication – to help resolve the gender digital divide by offering advanced technology skills in our program. Tell us a bit about the mentors you’ve had in your life and how they inspired you to succeed. I was very lucky to have an important mentor during my doctoral program in Dr. James Tankard. He taught me so many things – persistence in submitting and revising research, confidence in my approaches, ways to relate to students. I would not be the educator and scholar I am today without his mentorship. I have met some wonderful professionals who have added to my technology knowledge and been invaluable to my network. And, I am lucky to have a group of strong colleagues at Texas State that are supportive in our digital efforts. How important is mentorship/sponsorship in getting more women and minorities in the tech industry? Everyone needs mentors, but it can be difficult for women and minorities to find mentors with which they can relate. They need to be able to see something of themselves to be attracted to an industry, and the right mentors can help attract people to a field. Seeking out appropriate mentors should be a part of anyone’s career strategy. Don’t just wait for one to come along. Develop your network so that you have a range of mentors and peers, and be ready to reciprocate when the time is right. We get lots of emails from women ages 25-75 who say they think they are too old to code. What would you like to say to them? You’re not too old to code. It just takes the desire to learn. 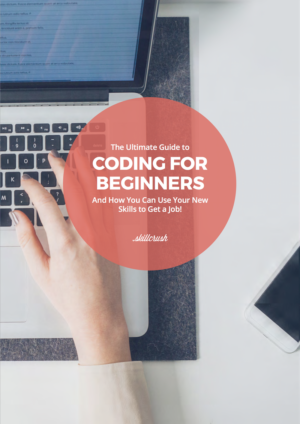 There are plenty of resources, and there are ways to make coding more relevant to what you want to do. I’d say focus on why you want to code and start seeking those skills in small steps. Use online resources. Try to find a coding buddy or join a meetup group so you can find people you can go to when you need help. You’ve got a relaxing work day at home. Tell us about your set up. What equipment are you using? What software? Latte or tea? What’s on your playlist? Set the scene. I work at home a lot. That is where I am most productive. When I am on campus, I am either in class or available to meet with students. I do most of my course prep, research and grading at home. Typically, I am on my sofa with my Macbook Pro, but I also have an iMac in my office, when I want to work on a larger screen. Coffee is probably involved. I usually have the television on in the background, probably the Food Network or a Gilmore Girls rerun. Or I am listening to music which probably includes some Wilco, Old 97’s and Spoon. I like a lot of indie music, like Phoenix and The National, and listen to local Austin bands, like Quiet Company.